Other studies indicated grey matter reductions in the left inferior parietal gyrus in schizophrenia and bilateral postcentral gyrus in chronic and first-episode schizophrenia compared to controls [69, 70]. Eight significant clusters were found with increased brain activation from pre- to post-training, compared with non-CRT patients [Table 2] and [Figure 2], (1) the left inferior frontal gyrus (1120 mm [sup]3, BA9); (2) the left medial frontal gyrus (512 mm [sup]3, BA32); (3) the right middle frontal gyrus (464 mm [sup]3, BA6); (4) the left precentral gyrus (416 mm [sup]3, BA6); (5) the right postcentral gyrus (416 mm [sup]3, BA2); (6) the left medial frontal gyrus (352 mm [sup]3, BA6); (7) the right sub-gyral (296 mm [sup]3, BA6); and (8) the left sub-gyral (216 mm [sup]3, BA6). Five clusters were found with increased brain activation in CRT patients from pre- to post-training, compared with non-CRT patients [Table 3] and [Figure 3],[sup],,,,, (1) the right middle frontal gyrus (568 mm [sup]3, BA6); (2) the right postcentral gyrus (552 mm [sup]3, BA2); (3) the left medial frontal gyrus (440 mm [sup]3, BA6); (4) the right inferior parietal lobule (280 mm [sup]3, BA40); (5) the left middle frontal gyrus (208 mm [sup]3, BA9). They found that the 'small world' property of the brain network of patients with schizophrenia was abnormal: (a) compared to normal brains the characteristic path length and the clustering coefficient increased; (b) the nodes in some brain areas had decreased centrality and thinner cortices (especially the left parahippocampal gyrus, inferior temporal gyrus, angular gyrus, and right superior frontal gyrus, which are part of the default network); and (c) the nodes in other brain areas had increased centrality, including nodes in the primary cortex (bilateral precuneous, left precentral gyrus, postcentral gyrus, and right Heschl gyrus) and the paralymbic system (bilateral orbital frontal gyrus, temporal pole, right cingulate tract, and inferior parietal gyrus). 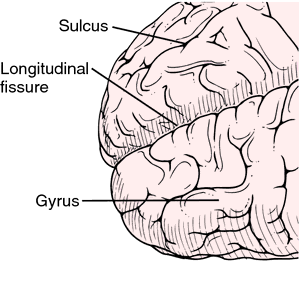 Reversed asymmetry was found for the postcentral gyrus. A paired t -test showed that when compared with the baseline, the patients with PD who were analyzed during the 2 years follow-up presented with increased fALFF values in the right middle temporal gyrus (MTG) and right middle occipital gyrus (MOG) and with decreased fALFF values in the right cerebellum posterior lobe (CPL), right thalamus, left superior parietal lobule, left IPL, left precentral gyrus, and left postcentral gyrus ( P < 0. 4] Luo and colleagues  reported that patients with OCD had a greater volume of white matter in the right precentral gyrus, the right postcentral gyrus, the bilateral precuneus, and the left middle occipital gyrus than control subjects; they also had a smaller volume of white matter in the bilateral superior frontal gyrus, the left postcentral gyrus, the left parahippocampal gyrus/ corpus callosum, and the right inferior parietal lobule.